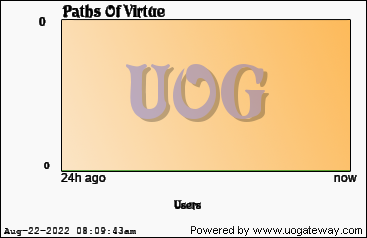 Paths of Virtue is an Ultima Online shard with an emphasis on immersion and role-playing. The shard is essentially a homage to the original Ultima single player games, particularly Ultimas IV and V, my favorite Ultimas as well as my favorite CRPGs. The shard eschews static quests and such in favor of trying to create a more open, persistent Ultima experience. LBR era. Custom map and client. 225 Stat Cap. 800 Skill Cap. Sill-based class system featuring the original eight Virtue Professions as well as a few lore-related professions. 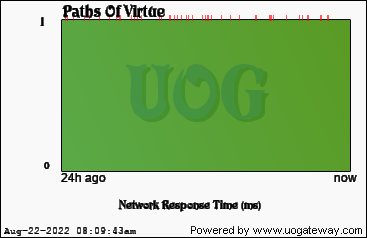 Stats last updated 242 seconds(s) ago using 204303 data samples.